Thinking About Sales: Is Integrity a Sales Strategy? This is a Customer Relationship Management article from guest poster Dave Kahle, author and leading sales educator. 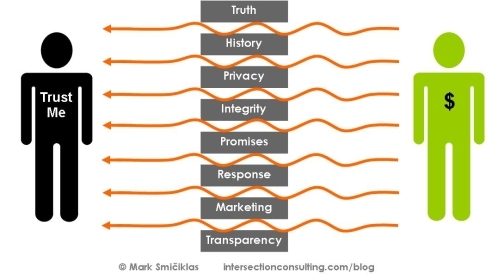 Image “Trust Filter” by Mark Simciklas on Flickr under Creative Commons license. I was speaking to a group of professional sales people in Johannesburg, South Africa, on the subject of integrity in business. At dinner later in the evening, my host, who had been sitting in the audience, sheepishly shared with me that several of the people seated near her snickered at the idea. Evidently, to them, sales was just a series of transactions, and the sales person’s job was to wring as much money out of each transaction as possible, under whatever means were necessary. Their position was, I believe, both sad as well as unwise. I believe that there are certainly practices in the business world where morality perfectly coincides with wise business. Integrity is one such practice. It is both good business as well as good morals. I believe it is such good business that sales people should adhere to a no-exceptions policy of maintaining absolute integrity. I’m not going to make the case for absolute honesty as a moral policy. That’s better left to our churches to do. There is, however, a powerful case to be made for honesty from a practical point of view. Honesty is a powerful sales strategy that is probably more important today than ever before. It works like this. If you have integrity, you save your customer time. In today’s frenzied world, time is more precious than money for a lot of people. If your customers cannot believe you, then they must spend hours, days or weeks of precious time confirming the representations you have made. If, however, they can believe you, then they don’t feel the need to check for the veracity of every fact or statement. Here’s an illustration. A few years ago, we attempted to purchase a condominium. The condo was in a resort location, and had been used as a rental unit. So it came fully furnished, down to the silverware and cooking utensils. We thought it was a good value, a wise investment, and offered the owner exactly his asking price. Shortly thereafter, word came from the real estate agent that the owner, on receiving our full price offer, had increased his price. The owner may have been looking at his action as a slick negotiating ploy. We saw it as a lack of integrity. If we couldn’t believe his stated price, then we couldn’t believe any of the representations he had made. We would be reduced to counting the number of knives and forks instead of believing the inventory sheet provided for us. We didn’t want to waste the time checking out every aspect of the deal. If we couldn’t trust some of the representations by the owner, then we couldn’t trust any. And, if we couldn’t trust any, it wasn’t worth it to us to take the risk in dealing with him. We walked away from the deal. We saw the owner’s lack of integrity as causing us to invest a great deal of time to assure ourselves that the risk was worth the money. In this case, we were the buyers who saw the seller’s lack of integrity as causing us to spend more time on the project. We chose not to do that. The same is true of your customers. The more your customer trusts you, the less risk your customer feels in dealing with you, and the less time necessary to invest in understanding the product, service or program you are offering. From the customer’s perspective, it’s easier and less risky to deal with someone you trust than with someone you don’t trust. And that can translate directly into dollars. I’m always willing to pay more for something if I can buy it with less risk. In other words, if I can buy it from a company or person I can trust. On the other hand, I’d rather not buy something at all if I have suspicious feelings about the vendor. Here’s another example. A few years ago I grew jealous of my neighbor’s lawn. His was far greener, thicker and fuller than my lawn. It was because he had a lawn care service fertilize his lawn several times each year. I determined to do the same thing. So I obtained the name and phone number of the company he used, formed an idea of what the service would cost me, and decided to do business with that company. I called the company, ready to buy the service. When I inquired about the types of service available, the sales person indicated that there were several options available. Now, I’m a visually oriented person, and I like to make decisions based on what I read, not on what I hear. So, I said, “OK, why not come out and do the first application, and leave me a brochure so that I can review my options, and then I’ll make a decision.” The sales person agreed. “But that’s not how we do it,” the sales person stammered. What happened? Here I was, as good a prospect as there ever was. I was ready to purchase, having decided to use this company, even calling them to make the purchase. Yet something in what the sales person said raised a red flag in my mind, and made me doubt the integrity of the person, and by inference, the company. He had originally said that I would be billed for only one application, and then implied that I was committing to an ongoing program. I viewed that as being deceitful, or at best manipulative. If I can’t trust them on that, on what can I trust them? There are lots of other lawn care companies, and the next one in the yellow pages got my business. Life’s too short, and business is too busy to deal with people you can’t trust. The question, then, for you as a sales person is this: Do your customers see you as trustworthy? That’s a difficult question to answer. You can’t just ask them, because you know you are unlikely to hear a candid response. But you can gain a sense of their perception of you by looking for some of the symptoms of trust or a lack of it. For example, if you find your customers sometimes buying from a higher priced source, or buying a product or service you consider to be inferior, it may be that your customer doesn’t trust you! On the other hand, if you find your customers accepting your word, and choosing to deal with you, even when you are offering an identical product at a higher price, then chances are they do trust you. Your reputation for honesty and integrity has been a smart business strategy, resulting in measurable benefits to you. Unfortunately, a reputation for trustworthiness and honesty is not a result of one event or a single transaction. It doesn’t develop out of some clever phrases you memorize and repeat. Rather, it develops over time as you adhere to a set of ethical standards in small as well as big things. It’s not a technique you use, but rather it’s the person you chose to become. As you strive to adhere to the standard of absolute honesty and integrity in all that you do, you’ll develop a character trait that will become evident to everyone around you, including your customers. And that is good business as well as good morals. Then, commit yourself to implementing a powerful and effective sales strategy – integrity. Dave Kahle is one of the world’s leading sales educators. He’s written nine books, presented in 47 states and eight countries, and has helped enrich tens of thousands of sales people and transform hundreds of sales organizations. Sign up for his free weekly Ezine. A great source of specific tools to help you with this issue is Dave’s book, Question Your Way to Sales Success. Check it out here.